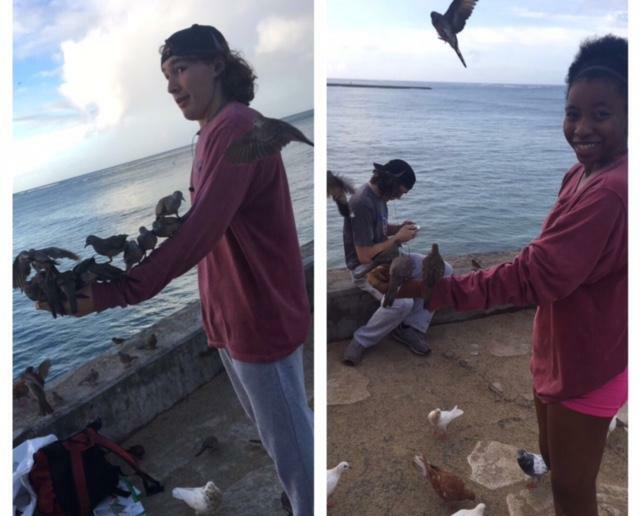 Sam Dardinski, left, and Daelin Brown, right, are pictured above holding birds. This was after Brown and Dardinski met a man who was feeding birds, and let them try it too. Today was a free day for us until Thanksgiving dinner. Being that it was Thanksgiving, it was a time to reflect on what I’m thankful for, but it was strange to not be surrounded by my family. I started off my day doing what I love: running. My two friends and I went on a 4 mile run. We got to explore parts of Honolulu that we hadn’t been to before. Along the way we had great sights to see and saw a man who fed birds off of his arm. He let us take some bread and try it too. After the run, I decided to go to the beach and go shopping. Hawaii was just like Times Square: an outdoor mall. Other people had fun filled days with excursions outside of Waikiki such a snorkeling, cliff jumping, and turtle watching. At the end of the day we had a great time on our own, but we got to meet up with the whole group to have Thanksgiving dinner. At dinner any friends and family that came along to Hawaii with the band got to come meet and eat with us. Many people got to eat with their families, but other people like me did not. It was a little sad to not have my family with me, but my friends made up for it. I’ve gotten closer to some people and met some people I didn’t even know on this trip. We all sat with each other, which made it feel like a family.